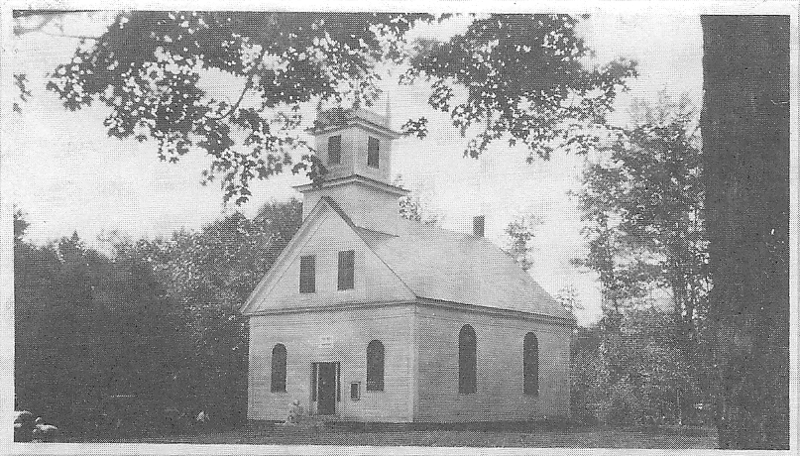 The Roxbury Meetinghouse, known as “God’s Barn”, from this 1912 photo, replaced the original meeting house which was raised in 1804. That was used as a place of worship, and following the approval of incorporation in 1812 it was then used for official government business as well. Roxbury was born in an Act of The New Hampshire General Court in 1812 and was formed from pieces of Packersfield [now Nelson], Marlborough and Keene. The creation of Roxbury was a co-operative effort led from within Packersfield by respected citizens. It took years of negotiations led by a determined group of families who had settled in the town’s southwest quarter at about the time of the revolution. They were united by their near simultaneous settlement and by their origin. Most came from Rutland, Massachusetts. Town Records make it clear that the special needs of those living in the southwest corner of the town were recognized and accommodated. They had roads, a school, leadership roles in Packersfield government and there was concern for their spiritual lives. It was a far different process than the formation of Sullivan over the “remonstrance” of Packersfield. It also took twenty-five years. The negotiation seems to have begun the year Sullivan was formed. The petition for a new town made the usual case of citizens being cut off from the center of the old town. In fact Packersfield residents living in what would become Roxbury had to travel about four miles by road to the Packersfield meetinghouse. 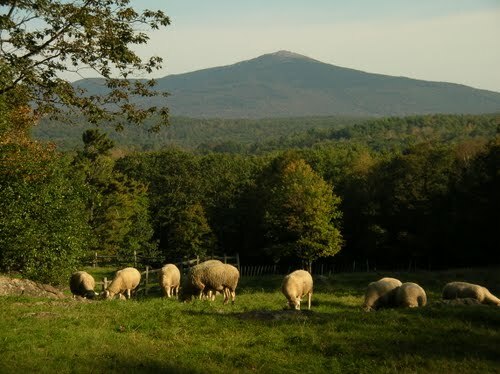 Still, southwestern Packersfield was connected by the town’s most important road – the one that connected it to Keene. Indeed there was a well-developed network of roads with road building as active there as in any part of the town. They had their own school house and most of the families mentioned in this article had sheds for their horses at the meetinghouse on the hill in Packersfield. The process was a negotiation not a seizure of land with Packersfield citizens presenting their case for a new town in Packersfield town meetings. Thanks to Dave Birchenough for the map work. Thus began a twenty-five year negotiation over the border between the towns of Packersfield and Roxbury. It seems citizens living in the southwest quarter were asking that the town vote to set off a piece of land two miles from west to east following the line of the newly formed town of Sullivan south for some distance then heading east and south following original lot lines in a stair step fashion until it joined the Dublin line at a point three miles east of the original southwest corner of Packersfield and a mile east of the beginning. 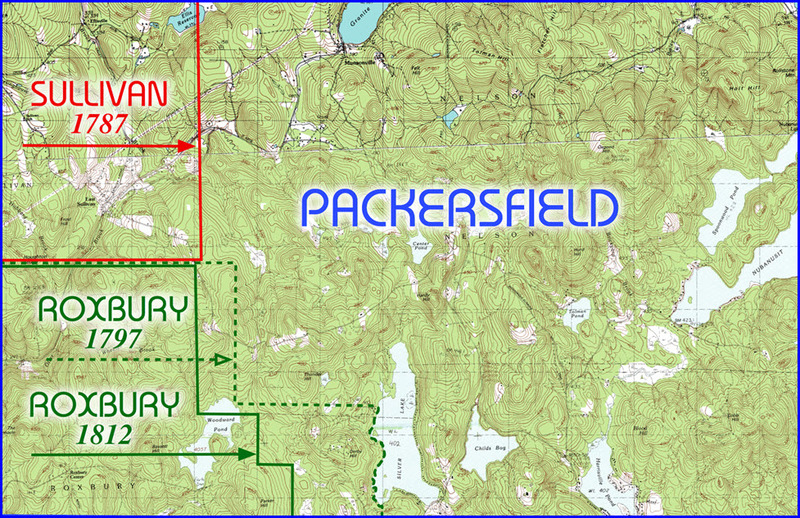 Packersfield voted to set off a smaller piece two miles wide at both north and south sides less the ministerial lot. They could have five square miles of Packersfield, not more. An article to expand the territory “set off” to the new town was frequently on the warrants of town meetings and consistently failed to pass. The ministerial lot was one of two 100-acre lots set aside in the original town layout to support the ministry in Packersfield. These lots were a common feature of all Masonian town layouts. Packersfield was in the process of selling this lot to finance the new meetinghouse. Other than the ministerial lot, the asset that may have been behind this difference over borders was the outlet of Woodward Pond where Ensign John Brown operated a mill at about this time. Religion was an essential part of eighteenth century life. The first public building in any new town was its meetinghouse – well before any school. Meetinghouses were the center of both religious and civic life. Petitions for new towns always cited distance from the site of Sunday worship to make their case. The records of Packersfield town meetings show concern for the spiritual needs of residents of the southwest quarter. As part of the process of hiring Gad Newell, the town’s second minister, hired at this time, the Town agreed to help any new town that might be formed in the southwest quarter with its ministerial costs. The voters of Packersfield supported the new town formation even at the expense of their financing plan for the new meetinghouse. From Town Meeting 1787: “Voted to suspent [sic] the Meeting House tax of the westerly part of Packersfield that is voted off until the last day of June next.” The meetinghouse tax was a special levy of one penny per acre for three years that was part of the town’s financing plan for its new meetinghouse. Nine years after the idea of a new town first appears in the records, a formal petition to form a new town was presented to the General Court of New Hampshire by Lott Cooke, a Packersfield citizen, and town-licensed tavern keeper, on behalf of residents of parts of Packersfield, Marlborough and Dublin. The General Court appointed a committee which reported favorably. All three towns voted against it. A reason given by the towns of Marlborough and Dublin was that the new town had no meetinghouse. It is ironic that the petition cited poor access to public worship as one of their reasons for desiring a new town. Packersfield’s objection continued to be the proposed boundary. Packersfield men working for the new town tried again the next year with the same result. In the meantime the group working to form a new town was meeting, keeping records of their proceedings and raising money. The group accepted a plan for a new meetinghouse and Joshua Lawrence, another Packersfield man, donated land for the building in Roxbury Center. In Sept 1804 a building was raised. Historian Samuel Wadsworth wrote that this first meetinghouse was larger than its later replacement which was 32’ x 42’. Solomon Buckminster, Robert Emes and Timothy Fairbanks sold pews in the unfinished meetinghouse to raise the money to finish it. Solomon Buckminster was a Packersfield selectman and represented the town in the General Court. Emes and Fairbanks held various town offices as well. In 1805 the group dropped the idea of incorporating part of Dublin and added part of Keene to their design, initiating a petition among certain residents of Keene, Marlborough and Packersfield. Sheep graze in Roxbury, oblivious to which town they are actually in. Packersfield records a petition signed by a number of inhabitants of the southwest part of Packersfield, the easterly part of Keene and the northerly part of Marlborough praying that the town of Packersfield would vote off a certain part of their town to accommodate a new proposed town. This layout was west of the Roxbury/Nelson line today with a jog to the east near Woodward Pond, then parallel to the present boundary south to the Marlborough line but one lot (100 rods) to the west. Packersfield modified its view of the boundary in an 1806 vote, but never agreed to the final layout. Through all this, Packersfield remained sensitive to the needs of its southwestern citizens. At town meeting in 1807 it voted to have the Packersfield minister spend some of his time preaching in the new meetinghouse at Roxbury Center. After years of stalling by Keene, Marlborough and Packersfield, Roxbury was chartered by the General Court on December 9, 1812. The Court empowered Robert Emes and Solomon Buckminster to call the first town meeting. That meeting elected them the Roxbury’s first moderator and selectman respectively. The border was as it is today except that the farm of Samuel Griffin, on the old road just west of today’s Apple Hill Music Camp (lot number four in range five of the southwest quarter) was retained by Packersfield. Griffin was a major general in the state militia and probably asked to have his 100-acre farm remain in Packersfield. The ministerial lot had been sold and went with Roxbury. In 1820 the legislature straightened the line adding Griffin’s farm to Roxbury. On the 200th anniversary of Roxbury’s founding that town presented the Nelson selectmen with a piece of granite from a Roxbury quarry. No hard feelings.